I've kept a sketchbook on and off from high school when I first decided that being an artist was going to be my life's work. But I'm not really much of a drawing person, and I never stuck with it consistently. 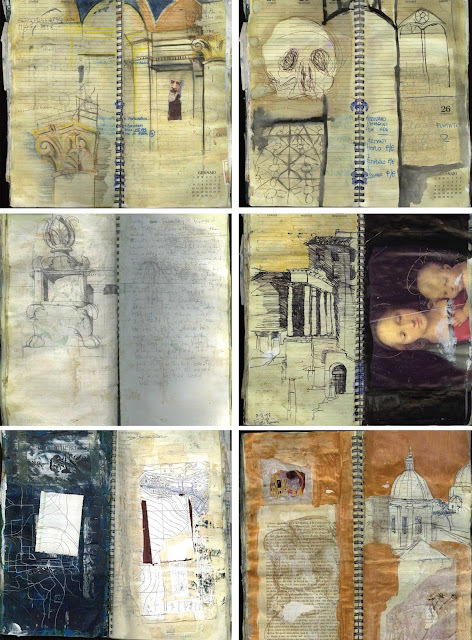 The first time I really fell in love with the idea of keeping a sketchbook was during a semester spent in Rome during art school. One of the classes was called "Sketchbook," and it involved going around to different sites in the city to draw. I would have gotten bored quickly if it was just a class about doing observational drawings, but luckily the teacher was into doing mixed-media work herself and encouraged us to think differently about what materials we used and the whole idea of a sketchbook. I started experimenting with different materials and pasting in scraps of paper and other things that I found during my wanderings around the city. The most amazing thing happened–one day when I was walking home to my apartment, I found a spiral-bound planner book that someone had lost. It had obviously been outside for a long time and was soggy from rain, so I figured nobody was going to claim it. I took it home, dried it out, and used it for my sketchbook class. I hate blank pages as a starting point, so it was really cool to be working in a book that already had things written in it, a nice patina from being left outdoors, and so much connection to Rome. That book (and others I made during that semester) was a real turning point in developing my artistic process and interests. For years after that, I worked inconsistently on some art book projects, but never really kept a regular sketchbook. At some point, I fell in love with the idea of doing a daily art project– just something small that happens every day (or as close to it as possible). I was reading a lot about habit formation and productivity, and I liked the idea of a project slowly accumulating over months or years. I made some short-lived attempts at keeping a daily sketchbook or doing a daily drawing, but never really stuck with it. I did successfully do a daily photo project from 2009-2014, in which I attempted to take a photo every day and post it on my website. I mostly used the Hisptamatic app on my phone, which had a lot of interesting filters. It was fun, but I got tired of it after almost 5 years. It seemed less interesting since Instagram became really popular and everyone seemed to be posting daily photos with filters. I also started working from home full-time, which limited the variety of things I was around to photograph. 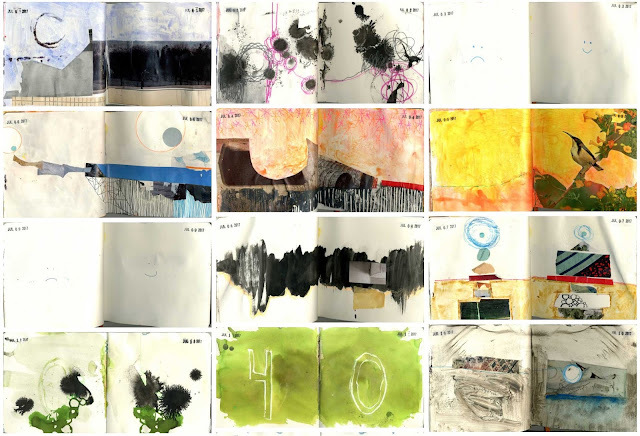 I started my current daily art journal project in August 2014 after I stopped doing the daily photos. It took a few attempts before I figured out what I really wanted to do with it, and it didn't become anything close to a daily project until January 2015. I think that constraints can often act as an enhancement to creativity, so I started out trying to limit myself to doing representational drawing. But I wasn't enthusiastic about it and it seemed like more of a chore than a joy. So I eventually decided I'd have no constraints regarding materials (my favorites are cut paper, ink, and Dr. Ph. 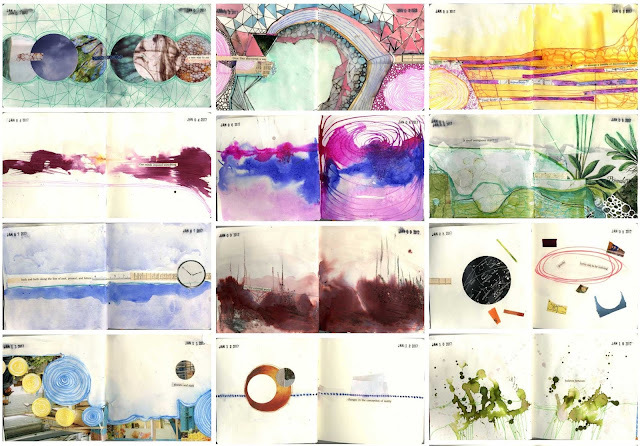 Martin's concentrated watercolors). 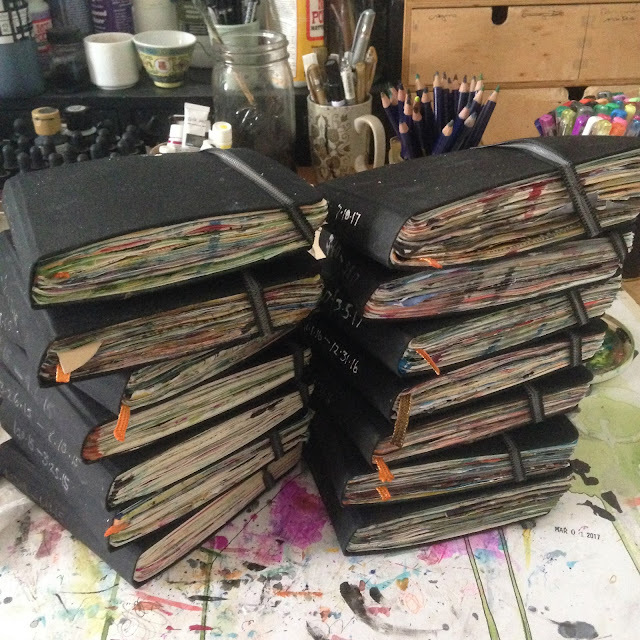 I tried several different sketchbooks and finally settled on the 5" square size of Hand Book Art Journals. The size is perfect for a small, quick drawing and the paper is thick enough to handle water-based media. At some point I decided to start posting photos of my daily pages on Instagram, and people started telling me how much they enjoyed seeing them every day, which was really nice and also motivating. This is very much a personal project that I do for myself, but it's also nice to know that anyone else appreciates it too! This past year I started doing time-lapse videos of the creation process- I just use my iPhone and a stand that clips to the edge of my art table. For me, this project is about trying to make art a priority every day. It's also about the idea that doing something is always better than doing nothing, and just having fun and exploring materials. It's about getting comfortable with sharing things that aren't finished or perfect. Some days I have more time and motivation and I end up doing pages that are more complex, and others I just do something super quick like swirling some ink around on the page. If I'm away from home I try to bring the book with me and usually just end up doing an ink doodle. Some pages are pretty and some are just kind of boring, and that's ok. Some days life intervenes or I'm just not feeling it and I don't do anything. At first I started just skipping those days in the book, but at some point I started pre-stamping the dates on each page (using a stamp I got from an office supply store). I like having the days pre-stamped because it provides a little bit of accountability for each day. Once the dates were pre-stamped, I started drawing frowny faces for the days I didn't do anything. Then I decided that seemed a little punitive and started drawing one frowny face and one happy face. Which I think is a great representation of my attitude about doing a daily habit–some days it doesn't happen, and that's not great, but tomorrow is another day. At this point, doing this project really does feel like a habit and a part of my day. I usually try to do the pages in the morning. If I have time to spend on larger art projects, then I think of this as a kind of warmup. If I don't have time to focus on making art that day, then at least I have done a little bit of art! I think a lot of people consider art-making to be a matter of inspiration and/or talent, but I've come to believe that it is more a matter of just showing up and doing the work, as often as you can. I'm not always in the mood to do sketchbook pages, but I do it anyway because it's a habit and I've committed to posting it online daily and it feels better to do it than to not do it. But 99% of the time, even if I'm not in the mood or feeling very inspired, I end up feeling much more motivated just by having done something. I do scans of all my journal pages and use them in my digital art process, and sometimes a page that wasn't that interesting on its own becomes just what I needed for another piece. So my advice to someone who is just starting out is to figure out how to keep making stuff as consistently as possible, without worrying so much about being motivated or inspired or even about having talent. If you want to make art, just sit down and do something, anything. If you do something every day for five minutes you will end up better at it than if you never do it! Also don't get too stuck on the idea of everything you make having to be "good." I think it takes a whole lot of time spent making "bad" art to learn how to make "good" art. You don't necessarily have to share the "bad" things with the world, but it can be incredibly liberating to do so. I think there's such a tendency these days to be so careful about how we present ourselves to the world, to curate our photos and posts and life, and it can be interesting to subvert that and to be realistic about how much work, false starts, mistakes, and do-overs actually go into making art. Thank you, Jen, for sharing your sketchbooks with us today and adding your voice to the conversation. *Photos in this post ©Jen McCleary. Used with permission.